Metal Sonic, the robotic doppelgänger of Sonic the Hedgehog, is the penultimate boss in Sonic the Hedgehog CD. Having last been seen at the beginning of Collision Chaos kidnapping the pink hedgehog Amy Rose, Metal returns to go head to head with the living being he is based on. Instead of a direct fight, Dr. Eggman has his arch-rival set against Metal in a race to the finish across the curved and twisted highways of Stardust Speedway. With the winner safely passing across the finish line, the loser is forced behind a blocked off wall, with nothing to look forward to but a yellow laser beam coming from the underside of Eggman's Eggmobile. Following the racers at every turn, Eggman is a constant presence, tearing up the highway and ultimately destroying the loser. Though Sonic is unable to use his spin attack against Metal, the robot hedgehog has the ability to attack Sonic at will. While running along normally does not allow the two to interact, Metal has two aces up his proverbial sleeve: the Maximum Overdrive Attack and the Ring Spark Field. The first allows Metal Sonic to lay flat out, hovering over the ground as a glowing yellow force field surrounds him, giving him a burst of speed that not only destroys any spikes in its pathway but can also harm Sonic, stopping the living hedgehog in his tracks. The second attack, though causing Metal to slow down, provides a powerful electrical field to surround him, making him glow blue and red, in the process being just as deadly as ever. Fortunately for Sonic, there are times when the possibility of using an alternate pathway above Metal Sonic arises, which not only lets Sonic run forward without fear of running into his double, but with any luck will place him far ahead in the race. At the end, if the player is able to keep Sonic ahead and run past the finish line first, the doorway slams shut, causing Metal Sonic to be destroyed inadvertently by the hand of his creator, the double's face breaking apart as Eggman flies away, preparing for one final confrontation with Sonic over the fate of the Little Planet. Before Sonic can rush off towards Metallic Madness, he must first free Amy Rose from the bonds that tie her, the young fan more than happy to embrace Sonic, hearts in the air much to the annoyance of her hero. 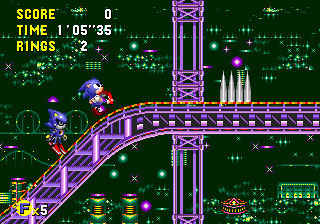 In the Japanese and European Mega CD versions of the game, the Bad Future music plays during the race even if you're in the Good Future. This does not happen in the US version. However, in the 2011 remake, the Bad Future music plays no matter which region's soundtrack you're using. This boss fight is recreated 18 years later in Sonic Generations (HD) as Metal Sonic (Sonic Generations boss). Sonic and Metal Sonic preparing to race, with Dr. Eggman above. Metal Sonic using the Ring Spark Field.